Did you know that it’s easy to make homemade Marshmallows? I didn’t until recently. When browsing through a hundred-year-old cookbook, I saw a recipe for Marshmallows. I was intrigued, and decided to give the recipe a try. The Marshmallows were fun and easy to make. They were light and fluffy (and so much fresher and tastier than store-bought marshmallows) – and would be perfect in cocoa, in s’mores, or roasted over a fire. Another plus- So many modern candy recipes call for corn syrup, so I was thrilled that sugar was the only sweetener in this recipe. Prepare an 8 inch by 8 inch pan by thickly covering the bottom of the pan with confectioner’s sugar. Combine the sugar and 6 tablespoons water in a heavy saucepan. Bring to a boil using medium heat while stirring occasionally until the sugar is dissolved; then reduce heat and continue to gently boil until it reaches the soft ball stage (245° F.). Do not stir. In the meantime put 6 tablespoons of water in a mixing bowl and sprinkle with the gelatin. Let sit for about 10 minutes or until the sugar mixture reaches the soft ball stage. Remove the sugar mixture from the heat and pour into the bowl with the dissolved gelatin while beating rapidly. Continue beating. When the mixture begins to thicken, add the vanilla, then continue beating until the mixture is very thick and sticky. The beating process will take 10-15 minutes. Pour the mixture into the prepared pan, and sprinkle with confectioner’s sugar. This mixture is extremely sticky. A mixing spoon that has been coated with butter or shortening can be used to spread the mixture in the pan. Let sit for at least four hours (or overnight), then cut into squares using a knife that has been coated with butter or shortening (or that has been dipped in boiling water). Coat the cut edges of the marshmallows by tossing in a bowl that contains powdered sugar. Posted on January 29, 2017 January 28, 2017 by SherylPosted in FoodTagged marshmallows, recipe. I made a batch of marshmallows years ago. Might have to try again. Like you, I think it’s nice that the recipe calls for sugar. They’re a fun novelty food to make. I made them with my daughter. We had a nice time cooking in the kitchen. She’d given me a new candy thermometer for Christmas, and this recipe gave us a good opportunity to try it out. Cooking with a daughter is very special. They did get much harder after a couple days – though they were still good in hot chocolate. I think that you’d enjoy making them. Wow, these looks so good! I used to make marshmallows, but always added whipped egg whites for fluffiness. It’s great to know that they’re not really needed. And no corn syrup is always better. It’s interesting to learn a little about the history of marshmallows. It seems like so many foods have become less nutritious as they’re been modernized. I wonder if marshmallows would stay soft longer if egg whites were used. These marshmallows began to harden a little after a couple days. I think that the use of either whipped egg whites or corn syrup might help keep them softer longer, but I’m really not sure. Sadly, you’re so right, so many of the foods became less nutritious with time. Until I saw the recipe in the old cookbook, like you, I hadn’t realized that it was possible to make homemade marshmallows. They look pretty, and I am sure taste better, but I would never work this hard. 🙂 Primarily, since I do not like marshmallows. Thanks for the updated recipe! This would be so very helpful! It’s nice to hear that you liked the updated recipe. Isn’t it funny that we are all so surprised that marshmallows can be made at home? Lol. I guess it’s the result of a society focused on consumerism. They sure had it right 100 years ago. Have you tried them with the orange extract as well Sheryl? It sounds delicious! Maybe I will try it one of these days. I will be sure to let you know if I do. 🙂 have a great Wednesday. I’m keeping my finger crossed that you decide to make them someday. I always love to hear about the experiences of others with this recipes, And, I hope that you also have a wonderful day. As l’m not a fan of marshmallows, it still is neat to know that there’s a recipe out there for how to make them. Be fun to make them for the grandchildren and cut them into fun shapes to float in their hot chocolate. What fun! I like the idea of cutting them into fun shapes. Since the marshmallows are on the sticky side before they are tossed in confectioner’s sugar, the shapes probably would need to be fairly basic. once again….drooling. 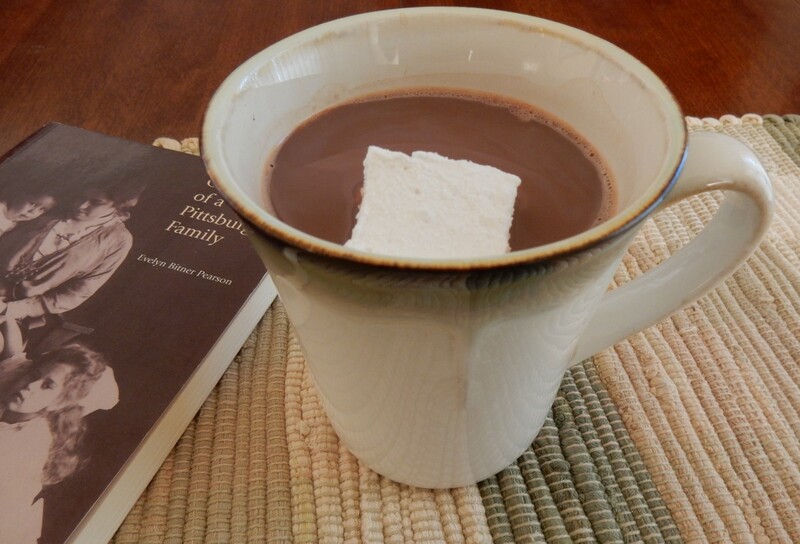 There’s nothing like a homemade marshmallow (or three) in homemade hot chocolate!! Yes, it would make a nice gift. The one downside is that these marshmallow don’t stay soft for as long as commercial ones–so they’d need to be gifted soon after they were made. It would be fun to see if the early settlers had a recipe for these using the plant — the marsh mallow. I can’t remember the last time I’ve had a commercial marshmallow, so I guess I’ll not be making these, but I don’t think there’s any question your recipe would make a tastier treat. I suspect if I lived in a colder climate, and drank more hot chocolate, I’d be giving them a try. Your comment makes we wish that I had a really old recipe that called for using the plant (and that I knew where to find the plant). It would be fun to see what a “real” marshmallow tastes like. I can’t believe it. The plant is native here in Texas, and while I was looking for a photo of it, I found a recipe. You can see it here. Wow, it’s amazing that you found a recipe for real marshmallows. Now I really want to give this a try – unfortunately I don’t think that marsh mallows grow around here. The flowers are beautiful. I always wanted to try to make marshmallows and I think I will try this one with sugar. I think that you’d enjoy making them. They’re fun to make (though it’s little messy to make them since the mixture is so sticky). I should give these a try. The grands like marshmallows and have to have natural which are quite expensive. If your grandkids enjoy trying things that are just a bit different from commercial products, I think that they would like these marshmallows. You never cease to surprise me. Home Marshmallows sounds like a wonderful treat. Perfect for this cold hot-chocolate time of year. They really weren’t difficult to make. The process was a little messy because the mixture was so sticky after it was beaten for a few minutes – but it wasn’t complicated. Interesting! I think I’d like to taste a home-made marshmallow! I think that you’d enjoy them. When they are fresh, the taste and texture is fairly similar to the commercial product. I want to try these at least once! My grandson will have fun making them, I’m sure. Did you beat by hand or with a mixer? You’re welcome. I think that you’d have fun with this recipe. These look amazing! I have been wanting to try homemade marshmallows for some time now. Thanks for the share! I made a bunch of marshmallows years back. Might need to attempt once more. Like you, I believe it’s decent that the formula calls for sugar. I realize that it’s easier to make candies (and marshmallows) using corn syrup – but I think that it is better to avoid using corn syrup whenever possible and enjoy seeing how old-fashioned recipes that call for sugar turn out. These look good, great way to control what’s in the marshmallows (such as NO corn syrup!). I agree! One reason I like making foods from scratch is that I know what ingredients I used. I think that you’d like them. It’s a fun recipe to make. Can’t wait to share with grandkids. Beautiful post. It’s wonderful to hear that you liked this post. Something I would never have thought of trying but it’s my husbands favourite so may just have to…great post! You should give it a try. The marshmallow’s are yummy. And, I think that you’d enjoy making this recipe. What an interesting post. Now I wonder when people started making marshmallows. I thought it was something invented by the processed food industry. 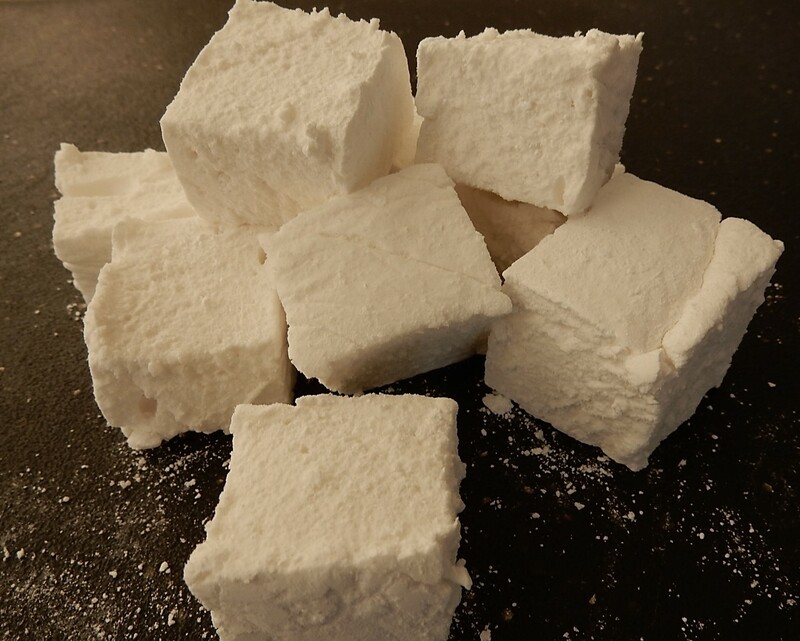 I’m guessing that people started making marshmallows in the late 1800s when powdered unflavored gelatin became available – though it was possible to make gelatin from scratch before that (but it was a very long tedious process). Good to know how to make marshmallow! I enjoyed making the marshmallow recipe. It’s something that I’d never previously considered making from scratch. Reading the above comments about corn syrup made me wonder if it is something to be avoided. So I read articles on-line about the negatives of corn syrup and how common it is as an ingredient in processed foods. I will look more carefully at labels now and try to avoid foods containing high fructose corn syrup. Thanks for all your comments. There are a lot of negatives to corn syrup – yet it definitely can make it easier to make smooth homemade candies without having to worry so much about crystalization. . . sigh. . . Why does it always seem like there are trade-offs that need to be considered? That said, I really like how most hundred-year-old candy recipes use sugar, maple syrup, or honey.